The Compelled Educator: Earbuds vs Interactions: Which one is winning at your school? 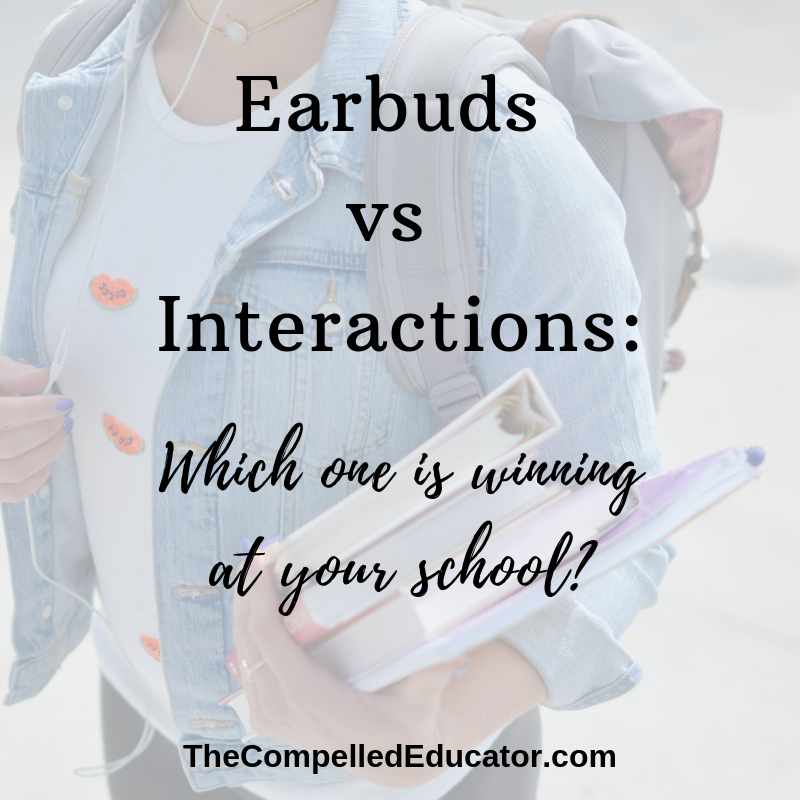 Earbuds vs Interactions: Which one is winning at your school? My parents bought me AirPods as a Christmas gift, and they have been a GAME CHANGER for me in my workouts. Not having to fight with a cord or be connected to my phone has been awesome! I totally understand the joy of using earbuds to enjoy music, podcasts, Voxer, and more. In my world, though, I can't imagine myself going to the grocery store with my AirPods in. I wouldn't wear them at work, and I haven't even worn them when I've taken an Uber somewhere. I also know and respect that my world and a teenager's world are different, with different needs and actions. You may be asking, Where are you going with that, Jennifer? All that to say... with two daughters who are young adults, and as an educator in a 1-to-1 school, I could totally relate to Jennifer Gonzalez's tweet in the image below. I see this in our school. I see kids in the hallway, cafeteria, and in classrooms with earbuds in their ears. “I completely agree- it's a rare treat for my kids to get to have their earbuds in. I let them do it a good deal last year, and I really ended up questioning myself. I felt like I was contributing to their inability to communicate well, deal positively with down time- all that stuff. So this year, as I've prevented them from having their individual music during independent work, they've questioned me. And I've answered with evidence about how our dependence on tech has made us more isolated, and more and more our students are without some vital communication skills as well as the ability to deal with frustration levels. I tell them that I want them to talk to each other about the content as they work, to be able to ask me questions, that sort of thing. “It concerns me greatly that so many of our students have become 'islands of isolation.' They walk down the hall, across the courtyard, sit in the cafeteria or library or classroom with earbuds/headphones on, reading their phones, etc. and absolutely no contact with those around them. “I have a no earbud and no phone zone. BUT it is a struggle daily. I've done it all. Asked to put them up. Taken them up. Had them put in bags. Written them up. I've decided that it's just going to be something I have to constantly deal with. The addiction to their phones is so real. Really. There are not many of us that have this rule. According to my kids, I'm the "ONLY" one. I know that is a stretch, but there could be some truth to that? One of our teachers shares her No Distractions Policy with her students at the start of the school year. This teacher is well known for using technology with her students, and on almost any given day, you can visit her classrooms and her students will be using technology such as Kahoot, Goosechase, digital breakouts, and more. I'm curious and want to learn from you... 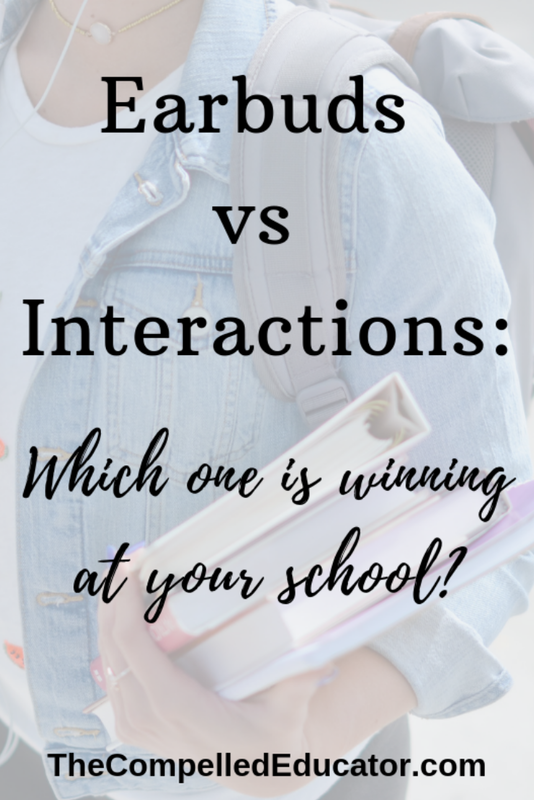 I'll ask again the question from Jennifer Gonzalez: What is your school doing to get students interacting more? Leave a comment below or connect with me on Twitter. I would love to hear from you.